A friend of mine who recently moved pointed out this light to me and how much she likes it. It’s the Cellula Chandelier at Design Within Reach, it’s $5,995, and it is beautiful. I love the simplicity of the bars at the top, offset by the details the lights and crystals below offer. It is well proportioned, and as my friend commented, has a great effect with the light diffused through all the crystals. And sometimes when you just love something, if you’re going to look at any other light you buy and wish you had bought the one you love, you should just buy that one you love. Update: It appears this version is no longer available unfortunately, but check out the versions below. But sometimes that just isn’t in the budget. So, after looking around the web here are some options that give a similar effect, but don’t come with the same price tag. They aren’t the same, mind you, but still great in their own rights. 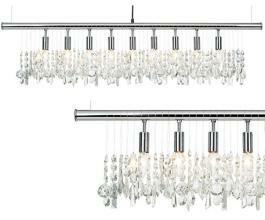 From LBL Lighting, the Bling Linear Suspension Light. This light is a little different in that the light comes from the bar, the lights are not mixed in with the crystals crystals (all 26 of them), but the crystals still reflect it off in different directions. It also has the advantage of being a low voltage light, saving you on electricity bills. I found four other lights that had lights and crystals hanging off bars. I could only find ones with the single bar, none with the rectangle shape. However, I wonder what it would look like if you hung two of them side by side? That could be interesting. My only hesitation is how it would look from either end of the rectangle (with no bar across), but it could work. This light also has Cellula in its name, and I suspect may have been designed by the designers of the one offered on DWR. This one has a lot of varied crystals amongst the lights, which would add extra color to the patterning of the light through the crystals. The designers were apparently striving for a modern reinterpretation of the classic chandelier, and I think they hit the nail on the head with this one. This Brodway Collection light is similar to the previous examples in that you can clearly see the row of light sockets before the bulbs and crystals start. It’s different in that there are many smaller lines of crystals among the lights. 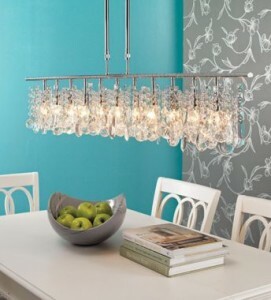 Similar to my other choices in that it has one bar and hanging crystals, the Clear Crystal Chrome Chandelier mixes in the crystals and the light sockets so you see less of the sockets and it appears to be a little more one unit, but also a little less modern. I think some of the reason for the dramatic difference in price of this light is they are not using Swarovski or Austrian-made crystals for the light, so the quality of the materials is different. But you get a similar look, though this light has the crystals and lights a little more mixed at the same height, with no space between the lights and the bar like the last option. Deviating now from the exact look as above, the Dain light covers the lights and crystals with an organza shade, for a more muted but still pretty look to it. And, there are crystals hanging down at the bottom so it will still have that pretty light-through-the-crystals effect on the chandelier as well as the light on the walls and table. 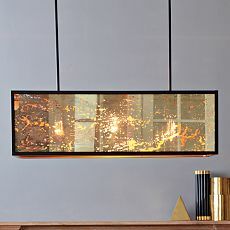 From West Elm, this is a complete departure from crystals and lights, but I think it has some of the similar sparkle effect to it, with the golden mercury glass. It’s modern with the shape and the bronze finish around the edges, but reminiscent of times past with the mercury glass giving a great effect to the light – having it brighter in some places than others.